Squash House Quilts: Ah, Spring! 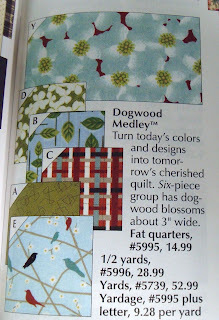 OK - so there are two months to go until Spring, but a quilter can dream, can’t she? Mr. Squash heard predictions of snow for the weekend on the radio this morning. I told him that “word”, which I shall not mention, is forbidden. He agreed that was fair - LOL! Yesterday my Keepsake Quilting Spring catalog arrived. As much as I would rather be browsing through fabric at local quilt shops, this is the next best thing! Does anyone happen to know whose line of fabric this is from page 17 of the catalog? I really love it - we have several mature Dogwood trees at the Squash House and I’m thinking this fabric line would make a terrific quilt to commemorate them! I’d like to research the entire line, but I need to know who the designer is! Please leave me a comment if you know - and you’ll also be entered in my Birthday Anniversay Giveaway! Not much else is going on at Squash House Quilts right now. I have an embroidery WIP but I’d like to wait until it is further along for you to have a peek. I try to sew a minimum of three “needle-fulls” every night so I can feel good about accomplishing something! I’ve had to put a temporary hold on Winter Wonderland because of our work around the house getting it ready to sell. And as I continue to clean out my 56-Drawer Chest, I find more projects I’d really like to be doing, but I keep telling myself there will be plenty of time soon for those! Her name is MIchelle Engel Bencsko and she has a blog called Cicada Daydream and an Etsy shop called Cicada Studio. She does lovely linens too. I've purchased from her in the past. Dogwood is by Michelle Engel Bencsko of Cicada Studio, she has produced this fabric line, her first with Henry Glass. Michelle is a gorgeous person, I was lucky enough to meet her in Houston back in October. Oh, I just realise that someone already told you that! Here's the link to her whole line. http://www.henryglassfabrics.com/. There's also a free pattern there. wow, now that is quilters helping quilters!! Wow, some girls know their fabric and designers. I am glad someone could help because I had seen the bird fabric on a blog last year but could not remember where. It is beautiful fabric. I love that fabric. Especially the birds. Sooooo will there be...........snow??? lolol We're getting rain. I see several have already told you that it's by Engel Bencsko for Henry Glass. Happy Birthday!! I'm with you on the spring wishing Candace! It was in the 60's and 70's here all week where i live in colorado but today we hit our high by 7 am and snow is expected for the next 4 days. I really did think spring was here early! I found your site through passion for applique, Carrie. I'm new to blogland this year, but am finding it very inspiring and friendly place.